Valentine’s Day is in two weeks and if you’re still on the hunt for the perfect gift to give to your loved one, we have you covered! Say hello to Luxor Box, aka the best gift you could ever give and receive. 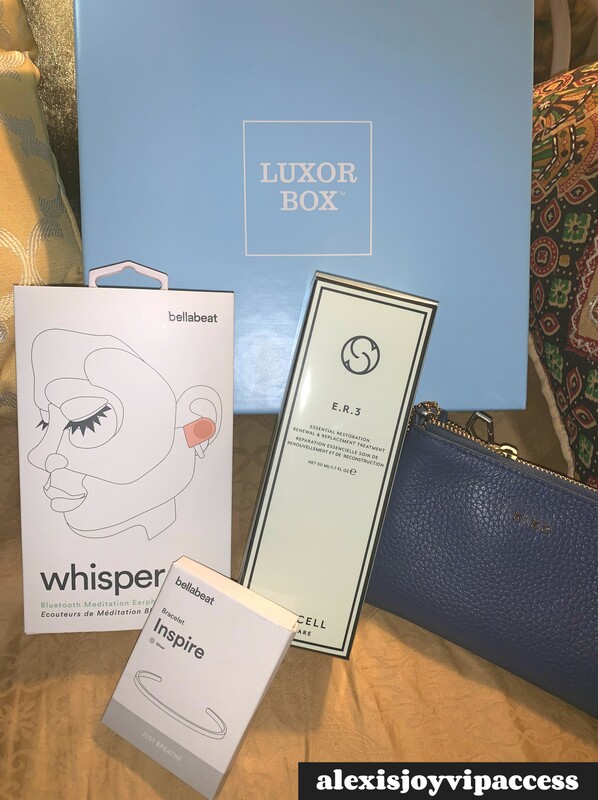 Luxor Box is a brilliant, subscription box service that sends out specially-curated boxes every-other-month filled with outstanding items ranging from spa products to beauty must-haves, apparel, jewelry and beyond. Luxor Box sets itself apart from other subscription box companies with its luxurious items, its incredibly classy box (which resembles the elegance of a Tiffany & Co. box) and of course, the company’s terrific, customer service. Time truly flies by when you’re having fun with Luxor Box! Once you join the Luxor Box family, you’ll always be on the lookout and excited for when your next box arrives. Luxor Box never fails to surpass subscribers’ expectations by making each box better than the one before. Luxor Box allows subscribers to choose from two different plans – either the Luxor Box plan or the Petite Box plan. The Luxor Box plan costs $139 every-other-month and includes four to nine, amazing items. If you decide to go for the smaller plan (which is a fun-sized treat! ), then you pay $50 every-other-month for a box that includes two to four items. Either option brings pure joy and several, useful items that you’re going to have so many heart-eye emojis for. It goes without saying, during this Valentine’s Day, you’re going to have something extra that you’ll fall in love with… your new Luxor Box subscription! To get you all even more excited over what you can look forward to when you join in on the Luxor Box fun, let’s take a look at the items inside the January Luxor Box below. Bellabeat Whisper Wireless Earphones: Calling all gym enthusiasts! Luxor Box presents your brand new BFF for the gym in the January box. This box contains Bellabeat’s fantastic, whisper wireless earphones. Not only is it perfect to use at the gym, when you’re going for a walk, or when you’re just in the mood to wind down and listen to some music, these earphones also come in a beautiful, rose gold color. Needless to say, you’re going to be stylin’ while rocking these earphones. Bellabeat Inspire Bracelet: Life can be super stressful and hectic sometimes, but the Bellabeat inspire bracelet is here to give you some encouragement. This item inside the January Luxor Box will be one that you’ll absolutely love. The Bellabeat inspire bracelet comes in either silver or rose gold and it has a motivating saying engraved onto it. My box had the gorgeous, silver Bellabeat bracelet that had the words “Just Breath” inscribed onto it. When you’re feeling overwhelmed, just stop and take a look at your Bellabeat bracelet for some words of wisdom. Kiko Leather Small Wristlet: Whether you are dressing up or dressing down, the Kiko Leather small wristlet is the best accessory to add to your #OOTD. My January Luxor Box included the blue, small wristlet. One of the many great things about this item is that you can either use it as a wristlet or tuck in the wrist strap to make it a small purse. The wristlet is made of genuine pebble leather and even includes two card slots where you can fit in your license and credit cards. Circcell Creme ER3: This item is definitely a go-to when it comes to taking care of your skin. The Circcell Creme ER3 helps the skin become firmer, more moisturized and improve its elasticity. Plus, all of the items are safe for the environment – what could be better than that?! If you’re ready to try out the subscription box trend, look no further as Luxor Box should definitely be your first choice. Luxor Box always gives subscribers an unforgettable and excellent experience. You’re going to adore all of the items you obtain from Luxor Box and you’ll be introduced to even more brands that may just become your new obsession. One thing is for sure: Luxor Box never disappoints. I, Alexisjoyvipaccess had the honor of kicking off 2019 with another remarkable, Luxor Box unboxing video. I am always so thrilled to work with Luxor Box and share with you all of the goodies inside the box. Check out my unboxing video below to see all of the sweet treats inside the January Luxor Box! You can become a member at Luxor Box’s website here. You can also purchase an individual box if you want to give it right in time for Valentine’s Day. Follow Luxor Box on Twitter and Instagram: @LuxorBox. Previous Article: Netflix Announces Its Leading Lady For Its Much-Anticipated, New Film Titled “Tall Girl” – PLUS, Find Out The Full Cast Here! Next VIPAccessEXCLUSIVE: Get The Perfect Winged Eye-Liner With Lyda Beauty’s Amazing Product – The Cleopatra Cat Eye Stamp!